Phillip Lim allows us to look at the first models of shoes Resort 2013 collection, a collection that remains pillowcases idea of ​​fashion is easier to carry and offers very characteristic patterns in terms of form. Just recently we had a look at the beautiful creations of spring summer 2012 collection, a line that knows how to get noticed without actually focus on spectacular tones are too bright or inserts that are the center of other high fashion collections. Let's take a look along with new branded Phillip Lim. Phillip Lim's line of sandals for the next hot season focuses on a particular form that provides the upper asymmetric. The models that you can better see in our photo gallery are in fact designed with wooden pyramid heel of 10 cm and with a particular upper that covers the tip-toe with an open-end and back up to the ankle, creating a border and the other asymmetric neckline , to the wide band closed with adjustable buckle and metal inserts. Phillip Lim thinks his sandals in different versions, from black leather charm and recalling the glam rock biker fashion, models in neutral tones such as salmon. But the most interesting there are sandals with mesh uppers more intriguing and far more expensive models in reptile skin, another must-have essential in the last period. Phillip Lim thinks his sandals in the original versions very flat, with a strap behind the heel and around the ankle and leather or mesh uppers, but always asymmetric. 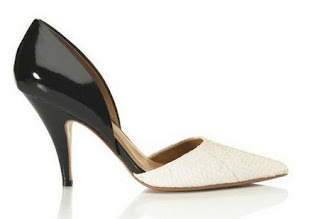 And asymmetric are also the pumps and decolletes of the line, models equally fabulous and original. We speak of beautiful decolletes for which has been chosen the characteristic shape of the models D'Orsay, ie low-cut on the sides. The pyramid-shaped heel pumps are medium, covered heel, toe and narrow necklines and elongated on the sides of the foot. They think in different materials and colors, neutral tones of orange and salmon, to the much more striking black and white bicolor versions of which part of the heel is designed in glossy paint. A collection of highly original and certainly the character conceived by the brand 3.1 Phillip Lim, give it a look in our pictures. There is a model that strikes you most?